Do you love the look of a bokeh background but don't want to get all inky? Here's the answer: Bokeh Dots background stamp! There are two stamps in the set - the other provides a lovely starry night effect. 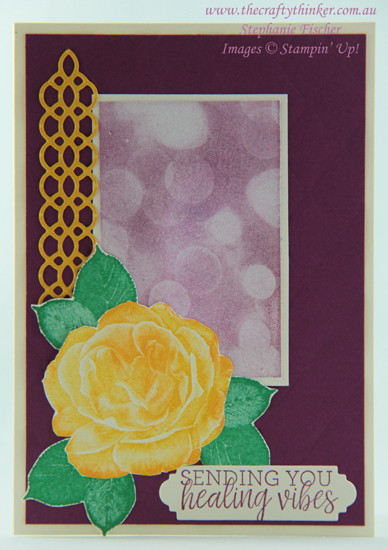 This is one of Stampin' Up's new Distinktive photorealistic stamps - just one stamp and it's done! The only trick is to make sure that your ink pad is neither too juicy nor to dry - I think of them as Goldilocks stamps - the ink needs to be just right! I stamped this Bokeh Dot background with Rich Razzleberry ink and layered it onto my Thick Very Vanilla base card and layers. The Rich Razzleberry layer has been embossed with the gorgeous Tufted 3D Dynamic Embossing Folder but, sadly, it desn't really show in my photo! The flower is from the Healing Hugs stamp set and is also a Distinktive Stamp. It looks gorgeous just inked with one colour but, for a little difference, I tapped it into Crushed Curry ink and then sponged some Mango Melody ink around the edges and a little towards the centre. I then added a couple of elements from the Petals and More thinlits: the Crushed Curry lattice and the label for the greeting.